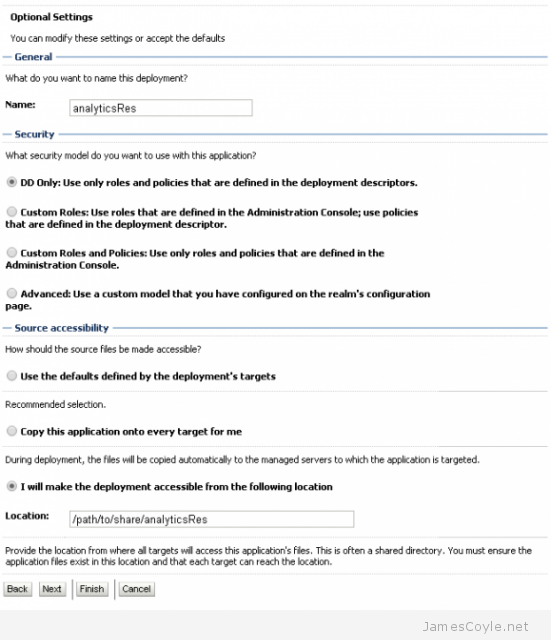 If you are using a cluster configuration, there are multiple methods you can use to deploy a skin. Below details a method which results in a single shared resource location that each member of the OBIEE cluster will use. 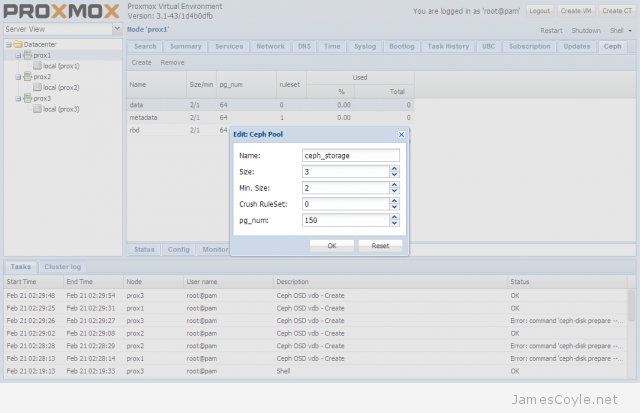 This walk through assumes you already have an OBIEE cluster installed. You will also need a shared storage mount on each of the servers. The storage must be shared, so that if you add a file on one server, it’s available for all the others. 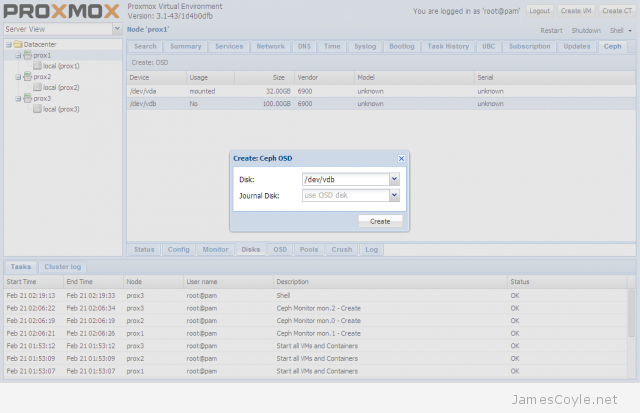 You can mount this storage in any location accessible by the oracle user. For this guide, we’ll assume you’ve mounted it in /path/to/share however a more realistic example would be something like /mnt/obiee_skins. Create a folder in the shared area called analyticsRes. Copy both the sk_ and s_ directories to the analyticsRes directory. Add or edit the following tags between <ServerInstance><WebConfig>. Note: The line which is commented out can be used, however this will be relative to each instances install location. This is fine for a single node install, but will cause problems with clustering as each cluster has it’s own instance. Add or edit the following tags replacing SkinName with the name of your skin. The skin name will be the name of the folder after sk_. Repeat the above instanceconfig steps for each node of the cluster. We now need to add an Application in Weblogic so that the images, JS and CSS in the skins and style folders can be served to clients browsers. 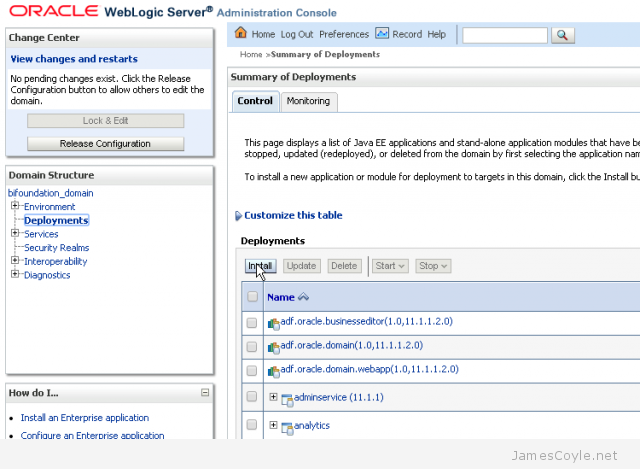 Log in to the Weblogic console. Select Deployments and click Lock and Edit on the left. Click the Install button to add a new deployment. Select Install this deployment as an application and click Next. Select the tickbox bi_cluster to enable this application for all nodes in the cluster and click Next. The next screen should be left as default for all options except the bottom one which should be I will make the deployment accessible from the following location with the path to your AnalyticsRes folder already filled in. Click Finish to complete the deployment. Click Deployments and find your new analyticsRes application which should be in a Prepared state. 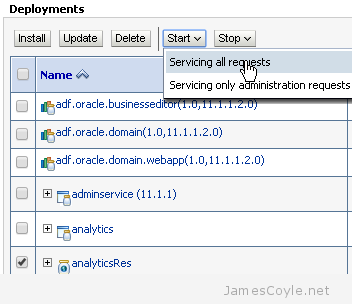 Click the tickbox next to the deployment and click Start and then Servicing all requests. You will have to restart all cluster nodes for the changes to take effect – specifically the Presentation Services. You can add other static resources to this folder which will be accessible from http://biurl.com/analyticsRes/example-resource.png. 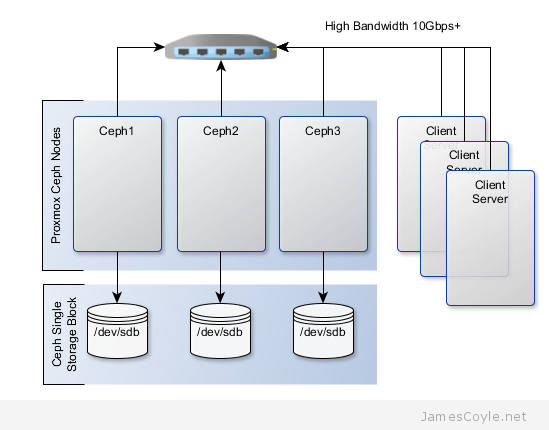 The below diagram shows the layout of an example 3 node cluster with Ceph storage. Two network interfaces can be used to increase bandwidth and redundancy. This can help to maintain sufficient bandwidth for storage requirements without affecting client applications. This example will create a 3 node Ceph cluster with no single point of failure to provide highly redundant storage. I will refer to three host names which are all resolvable via my LAN DNS server; ceph1, ceph2 and ceph3 which are all on the jamescoyle.net domain. Each of these nodes has two disks configured; one which runs the Linux OS and one which is going to be used for the Ceph storage. The below output shows the storage available, which is exactly the same on each host. /dev/vda is the root partition containing the OS install and /dev/vdb is an untouched partition which will be used for Ceph. SSH Keys are set up between all nodes in your cluster – see this post for information on how to set up SSH Keys. You will need to perform the following steps on all nodes in your Ceph cluster. First you will add the Ceph repositories and download the key to make the latest Ceph packages available. Add the following line to a new /etc/apt/sources.list.d/ file. Add the below entry, save and close the file. Download the key from Ceph’s git page and install it. Update all local repository cache. Note: if you see the below code when running apt-get update then the above wget command has failed – it could be because the Ceph git URL has changed. Run the following commands on just one of your Ceph nodes. I’ll use ceph1 for this example. Update your local package cache and install the ceph-deploy command. Create the first Ceph storage cluster and specify the first server in your cluster by either hostname or IP address for [SERVER]. Now deploy Ceph onto all nodes which will be used for the Ceph storage. Replace the below [SERVER] tags with the host name or IP address of your Ceph cluster including the host you are running the command on. See this post if you get a key error here. 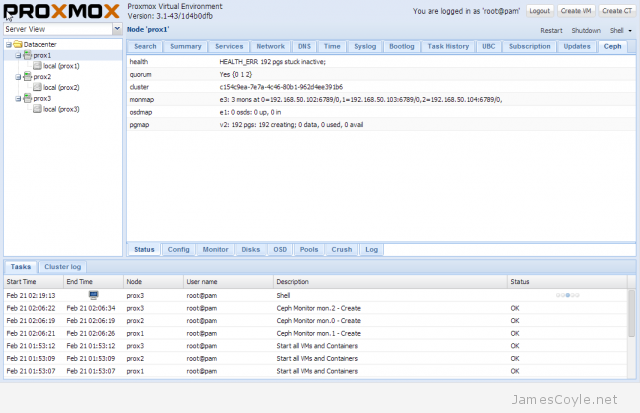 Install the Ceph monitor and accept the key warning as keys are generated. So that you don’t have a single point of failure, you will need at least 3 monitors. You must also have an uneven number of monitors – 3, 5, 7, etc. Again, you will need to replace the [SERVER] tags with your server names or IP addresses. Now gather the keys of the deployed installation, just on your primary server. It’s now time to start adding storage to the Ceph cluster. The fdisk output at the top of this page shows that the disk I’m going to use for Ceph is /dev/vdb, which is the same for all the nodes in my cluster. Using Ceph terminology, we will create an OSD based on each disk in the cluster. We could have used a file system location instead of a whole disk but, for this example, we will use a whole disk. Use the below command, changing [SERVER] to the name of the Ceph server which houses the disk and [DISK] to the disk representation in /dev/. We now have to calculate the number of placement groups (PG) for our storage pool. A storage pool is a collection of OSDs, 3 in our case, which should each contain around 100 placement groups. Each placement group will hold your client data and map it to an OSD whilst providing redundancy to protect against disk failure. To calculate your placement group count, multiply the amount of OSDs you have by 100 and divide it by the number of number of times each part of data is stored. The default is to store each part of data twice which means that if a disk fails, you won’t loose the data because it’s stored twice. Now lets create the storage pool! Use the below command and substitute [NAME] with the name to give this storage pool and [PG] with the number we just calculated. You have now completed the set up for the Ceph storage pool. 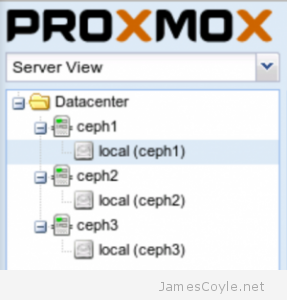 See my blog post on mounting Ceph storage on Proxmox. Clustering is a technique to group together multiple machines or devices providing common parameters, such as storage, over all machines in the cluster. 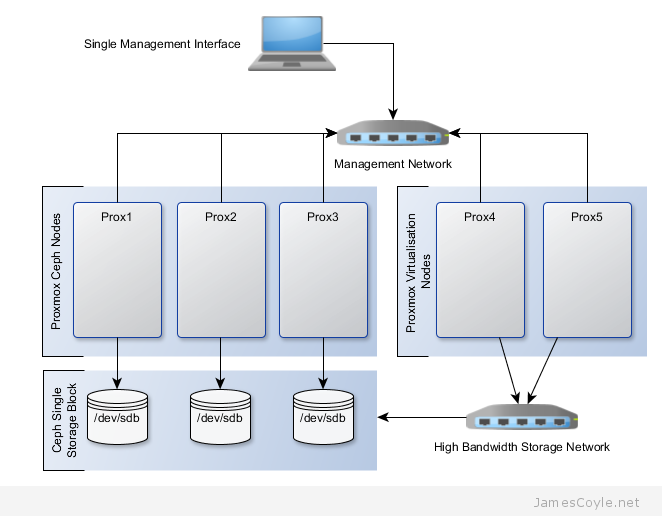 Proxmox can be clustered to provide a common interface to control all machines in the cluster. Automatic failover of machines can also be achieved with a Proxmox cluster however this requires significant setup and it not available out of the box. I will discuss VM failover in a future blog post. To join one or more nodes to a Proxmox cluster we must first create a cluster on one of the machines. Run the below command on your first Proxmox node and replace [CLUSTER_NAME] with a name for your cluster. Once a cluster is created, you can check the status using the status command. You can use the nodes command to view all nodes in the cluster. Adding a new node to a Proxmox cluster is easy and only requires the hostname or IP address of the primary cluster node. It is highly recommended to use a hostname or DNS entry over an IP address to shield any IP address changes. On a non-clustered node, log in and run the pvecm add command and specify the IP address or hostname. 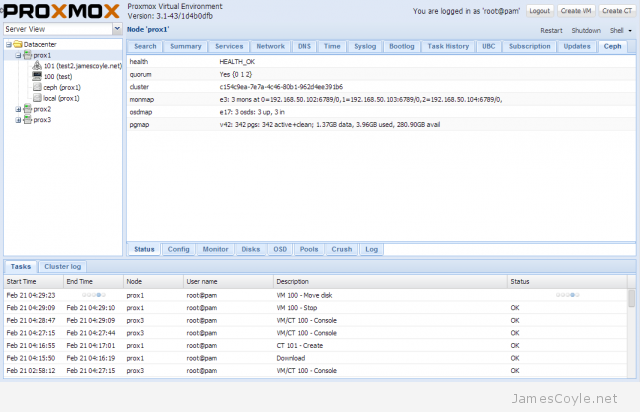 You can use the IP address or hostname of any already clustered Proxmox node. You must not have any virtual machines/ OpenVZ containers running on the node which you are adding to the cluster. All nodes should also be running the same component versions of Proxmox to ensure compatibility.